Who Will Roll the Dice on Michael Vick? 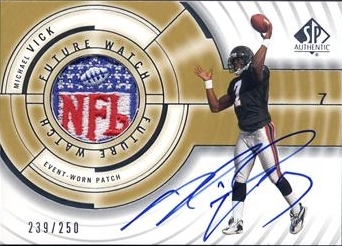 I always wanted a 2001 SP Authentic Michael Vick rookie card. But it was just too darn expensive. I wanted it more for its innovation than for the player on it. I never really was a big Vick fan. I loved him as a college quarterback, and was disappointed when he left Virginia Tech with two years of eligibility left. In the NFL, he’s been a Pro Bowler and a professional bonehead. He may be the most athletic quarterback of all time, but Vick never changed the quarterback position like many people said he would. Now he’s on the verge of making his comeback—not from injury, but from prison. NFL Commissioner Roger Goodell conditionally reinstated Vick just before training camps opened. While he can participate in preseason games, it will be decided by Week 6 when Vick can play in regular-season games. He needs a team first. Personally, I wouldn’t touch the guy if I were an NFL team, not as a quarterback, anyway. In Vick’s last four seasons, his quarterback rating didn’t crack the 80s. But surely Vick will land somewhere, maybe even as a hybrid offensive weapon if not a quarterback. Below are a few teams that might be a good fit for the former No. 1 overall draft pick. I’m not saying that these teams need Vick, but they have holes, and some of them just might be Vick-shaped. In a lot of ways, this seems like a terrible fit, and in a lot of ways it seems like a great fit. Do the Patriots need Vick? No. But that’s the genius of it: No other team may be better equipped to handle the circus that he will likely bring. Matt Cassel is gone, and Vick could be the backup or perhaps used as an extra offensive weapon. While it now seems more likely that this won’t happen, it’s not hard to see why this makes a lot of sense. Does anyone know who’s going to QB the 49ers this year? Bring your quarters, because it will probably be a carousel ride. Vick would give them some experience, and at least he’s won a playoff game. Rookie Michael Crabtree won’t make much of an impact if there’s no one to toss him the ball. The 49ers might not want to go away from one No. 1 pick bust (Alex Smith) to another one who just got out of prison. (Not good PR with the fans.) Shaun Hill was decent last year, and the 49ers went 7-9, but you know they’d like to raise the bar. Matt Hasselbeck turns 34 next month and played in just seven games last year. He doesn’t have many more good years left in him (if any). Seneca Wallace has been adequate, but he’s a poor man’s Vick. He and Vick are also the same age. The ’Hawks drafted QB Mike Teel (whoever that is) in the sixth round, but could get a boost with Vick. Seattle finished 29th in the NFL in passing yards last year, so they can’t be too picky. You’ve gotta love Trent Edwards’ moxie, but he’s … wait … T.O. plus Michael Vick? Never mind. Kyle Orton? Seriously? The Broncos sure got the raw end of the Jay Cutler trade. The second-best passing team in the league last year is likely to take a big step back in 2009. New head coach Josh McDaniels might not want to take on Vick and his full set of luggage, but he’s more talented than Orton. This summer’s Brett Favre saga showed that the Vikings are interested in giving another QB a shot. It also showed that the position is still as solid as a bowl of Jello. They drafted the junior varsity version of Vick in 2006 (Tarvaris Jackson). Why not just upgrade to the original? The Vikings ranked 25th in passing last year, and while Vick would have some definite adjusting to do, the team doesn’t have much to lose in the air game. Plus, they have established themselves as a running team anyway, and they’d have Vick and Adrian Peterson in the same backfield. Tasty! Like I said, Vick will probably land somewhere, but don’t expect to see much of him this year. Does he deserve a second chance? I don’t know. Yes, bankrolling a dog fighting ring and lying about doing it is despicable. Then again, some athletes have done even worse things and remained active athletes. No matter who gives him that second chance, he’s on the fast track to being out of the NFL for good: but maybe there are a few more 60-yard touchdown runs left to thrill the fans.